Daily Jewelry Deal: Girls' Sport Softball Rhinestone Crystal Earrings - $14 Shipped! 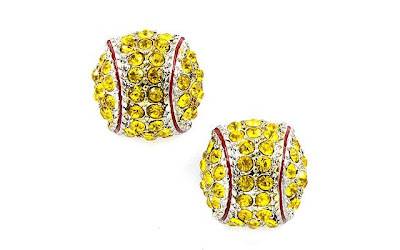 This pair of Girls' Sport Softball Rhinestone Crystal Earrings is currently selling for just $11.50 on Amazon.com! The price of shipping is just $2.50, making your total cost $14.00 for this jewelry deal. What I like about these softball earrings is how vivid the yellow rhinestones are. They would make a unique gift for a girls softball player or a female softball coach!